They may look cranky with that wrinkly face and stout and muscular build, but English bulldogs are the ultimate family dog. Easy going and affectionate, bulldogs crave human attention. Their high tolerance for pain allows them to put up with the poking and prodding of young children and they are renowned for their patience. Due to their stocky build and short snout (which can cause breathing problems), English bulldogs require little exercise. They are comedians, however, and do enjoy a good game now and then, as long as they don't spend too long in the heat. Those stubbly legs may make the bulldog appear slow, but it still enjoys chasing after a toy. Toss a ball a short distance and watch your bulldog pounce happily after it. If you want to add more excitement to the game, try a Frisbee instead of a tennis ball. Some bulldogs will jump to retrieve the disc from the air, making the game more entertaining for the both of you. Be careful with fetch, however, especially on hot days. 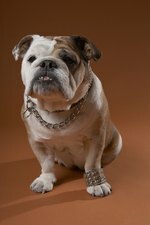 The bulldog's short snout makes in unable to tolerate heat, and it can suffer from heat stroke quickly. Keep games of fetch short, don't force your bulldog to chase long distance throws and give your dog plenty of water to drink. This is a good game you can play inside or outside. Don't worry about this game's reputation as a contest for dominance. A well socialized bulldog is laid back and eager to please and it won't take winning or losing seriously. It is a cooperative game that can give you and your bulldog some quality bonding time. Be warned, however, as bulldogs are muscular and they have strong jaws, which means you may find yourself dragged across the floor. You can play this game with your bulldog's favorite toy or favorite snack. Ask your dog to sit and stay in one room and then go into another room to hide the toys or treats. Release your dog and encourage it to find the hidden objects. Let your dog know beforehand that you had something desirable, however, or it won't know that it's supposed to be looking. This game allows bulldogs to practice some instinctive behaviors (hunting, an instinct for almost all dogs) and give its nose and mind a workout. Your bulldog will also feel very proud of itself for finding the prize. Reward it by praising it or tossing the toy a few times. This is a less interactive game than the others, but it can still give your bulldog mild exercise and mental stimulation. Place bite size treats into a puzzle ball or toy. Your bulldog will have to earn the treats by pushing the ball around (or squishing it just right) to get them out of the toy. Puzzle toys can keep your bulldog entertained for long periods of time (depending on how many treats you hide inside).